Тема выпусков военная история в комиксах. 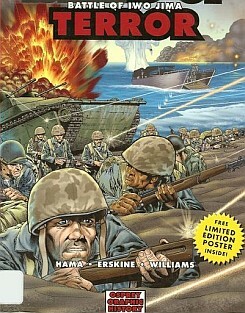 Osprey Graphic History present compelling true stories of war in a gripping comic strip narrative, written and developed by renowned comic book writers and illustrators, which will appeal to children and adults alike. The stories are supported by a wealth of historical detail, including further reading on the causes and consequences of the events, the key players, a glossary of important terms and where to find out more. Fast-paced action, historical accuracy, exciting art and comprehensive supporting materials complete these stories of momentous events in history.